Ädelbrook is blessed to benefit from the dedication of many volunteers who give of their time and talent to help us better serve our communities. There are a number of opportunities for volunteers to get involved, whether by working directly with our youth or by working in areas which support our staff as they provide services to our young people and their families. Much of the programming for our young people focuses on building positive relationships and interpersonal skills. The Volunteers from the community give them opportunities to interact in positive ways with individuals and diverse groups allowing them to practice the new skills they are developing. All volunteers go through orientation when they begin working with Ädelbrook. Additionally, they receive applicable training relevant to their volunteer work and ongoing supervision. 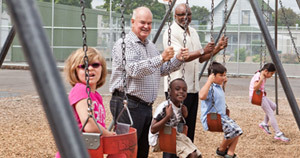 The Buddy Program was created in 1989 to bring mentors to the residents of Ädelbrook, including the group homes. Volunteers are matched as mentors with our youth to become supportive role models and friend as the youth work through their treatment. Mentoring with the Buddy Program allow Volunteers to develop a relationship with the youth through shared quality time and interests. Mentors are asked to commit to visiting with their “buddy” one hour per week for the duration of the young person’s stay with Ädelbrook. Currently, residents stay with us for an average of 9 months. Volunteers are welcome to visit more often and for longer periods of time (as long as visiting doesn’t interfere with their therapeutic appointments), however, this is the minimum commitment we require. Buddy Program Volunteers must be 21 years of age or older. Tutors are needed to help our residents and students of The Learning Center. Tutoring is a great way to connect with the youth in our programs and help them succeed in their academics. We ask our tutors to come in once a week and meet with students for an hour. Though we need tutors for all subjects, our most common needs are in math and language arts. Activities volunteers work with our Volunteer Coordinator and Therapeutic Recreation staff to help with games and special activities for the youth in our programs. These activities are designed to promote good sportsmanship, cooperation and improving social skills for our young people. Activities volunteers can help sponsor an activity night of board games or perhaps a basketball game in our gymnasium. If an individual has a hobby or interest such as knitting, model building, sewing, yoga, or any other activity, we welcome them to come and teach a lesson (or several) to the youth here. Other larger scale ideas might include an ice cream social or a night of Bingo complete with prizes. Be creative! Themed socials are limited only by your imagination! Event volunteers are needed to help with our fundraising events such as Golf for Kids and Cheers for Ädelbrook. Event volunteers help secure donations and sponsors, help with booklet ads, secure participants, put up flyers and signage and help at the events. If you would like to learn more about our fundraising events, contact Sharon Graves at (860) 635-6010 x327 or at sgraves@adelbrook.org. Office volunteers are needed to help with filing, record keeping, assembling mailings and other office related tasks. Office help is needed in all of our programs and in our Administrative offices. For more information about any of these volunteer opportunities contact Volunteer Coordinator Bernice Jalbert at (860) 635-6010 x363 or via email at bjalbert@adelbrook.org. We Greatly Appreciate Your Generosity & Support! Can I Send My Gift by Mail? Ädelbrook accepts gifts of cash, securities and tangible items that can be used in the service of helping those in our care. In addition, Ädelbrook will accept automobiles, real estate or other tangible items provided they may be of use to Ädelbrook or can be liquidated. Unrestricted gifts of cash, securities, bequests or other financial resources that can be used to supplement programs or operations or which can be liquidated to provide funds for operations or other needs. Restricted gifts that support Summer Camp or Summer Work Study Experience; wish list needs and special activities for children who live or go to school at Ädelbrook. Gifts to the Endowment Fund This is a wonderful opportunity to take advantage of tax savings today or give through a bequest or other types of delayed giving. Ädelbrook’s Development Office can give you suggestions for trusted experts who are available to work with you and your financial planners. Ädelbrook hosts many underfunded or non-funded activities that go beyond what is required by agencies that refer children into our care. These include summer education and worker preparation projects, religious education, summer camps, field trips, cultural events, recreational activities, and social and life skills activities. Moreover, private funding ensures both the future and character of Ädelbrook to provide the finest facilities, equipment and opportunities for our kids. Your support is what makes Ädelbrook exceptional. Please feel free to contact Sharon Graves at (860) 635-6010 x327 or at sgraves@adelbrook.org. You can support the important work of Ädelbrook by mailing a gift to: Attn: Development Ädelbrook 60 Hicksville Rd. Cromwell, CT 06416 Checks may be made payable to “Ädelbrook”. Ädelbrook is a 501(c)3 nonprofit organization and all gifts are tax deductible to the extent the law allows. One way to help the youngsters in our programs at Ädelbrook is by donating items that are needed by our residents and at our on-grounds school, The Learning Center. Thank you for thinking of the children! If you wish to donate any of these items or if you have any questions, please email Sharon Graves or call at (860) 635-6010 x327. Thank you for thinking of the children! If you wish to donate any of these items or if you have any questions, please contact Sharon Graves at (860) 635-6010 x327 email sgraves@adelbrook.org or visit us online at www.adelbrook.org.